Today is the Feast Day of Blessed Pierre (Peter) Favre, one of the "First Companions," that is, one of the original member of the Society of Jesus. He, St. Ignatius Loyola and St. Francis Xavier enjoyed a very close friendship, which began at the University of Paris, where the three were roommates. It is unfortunate that Favre (sometimes rendered as "Faber") is not as well known as Xavier; his life, while less "adventurous" than Xavier's is just as inspiring and is probably more easily related to that of contemporary Catholics. And among all the Jesuits it was Favre, said Ignatius, who was the most adept at giving others the Spiritual Exercises. Here is a meditation on the friendship between the three men. With his talent for friendships, St. Ignatius Loyola enjoyed close relations with a large circle of friends. (That is one reason for his enthusiasm for writing letters.) Indeed, the earliest way that Ignatius referred to the early Jesuits was not with phrases like "Defenders of the Faith" or "Soldiers of Christ," but something simpler. He described his little band as "Friends in the Lord." His commitment to a simple life impressed his new friends. So did his spiritual acumen. For Favre, a man troubled all his life by a "scrupulous" conscience, that is, an excessive self-criticism, Ignatius was a literal godsend. "He gave me an understanding of my conscience," wrote Faber. Ultimately, Ignatius led Peter through the Spiritual Exercises, something that dramatically altered Faber's worldview. Imbued with a simple piety toward Mary, the saints, relics, processions, and shrines, and also angels, Peter clung to the simple faith of his childhood. Ignatius, on the other hand, had spent many years as a courtier and some of them as a soldier, undergone a dramatic conversion, subjected himself to extreme penances, wandered to Rome and the Holy Land in pursuit of his goal of following God's will. Before that--I mean before having settled on the course of my life through the help given to me by God through Inigo--I was always very unsure of myself and blown about by many winds: sometimes wishing to be married, sometimes a doctor, sometimes a lawyer, sometimes a professor of theology, sometimes a cleric without a degree--at times wishing me to be a monk. In time, Peter decided to join Ignatius on his new path, whose ultimate destination was still unclear. Peter, sometimes called the "Second Jesuit," was enthusiastic about the risky venture from the start. "In the end," he writes, "we became one in desire and will and one in a firm resolve to take up the life we lead today....” His friend changed his life. Later, Ignatius would say that Faber was the most skilled of all the Jesuits in giving the Spiritual Exercises. Francis Xavier was far more resistant to change than Peter Favre had been. Only after Peter left their lodgings to visit his family, when Ignatius was alone with the proud Spaniard, was he was able to slowly break down Xavier's stubborn resistance. Legend has it that Ignatius quoted a line from the New Testament, "What does it profit them if they gain the world, but lose or forfeit themselves?" As John W. O'Malley writes in The First Jesuits, Francis's conversion was "as firm as Faber's but more dramatic because his life to that point had shown signs of more worldly ambitions." 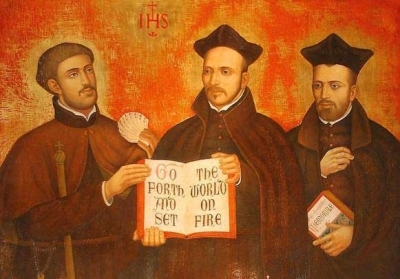 It is impossible to read the journals and letters of these three men--Ignatius the founder, Xavier the missionary, and Faber the spiritual counselor--without noticing the differences in temperaments and in talents. In later years Ignatius would become primarily an administrator, guiding the Society of Jesus through its early days, spending much of his time laboring over the Jesuit Constitutions. Xavier became the globetrotting missionary sending back letters crammed with hair-raising adventures to thrill his brother Jesuits. (And the rest of Europe, too: Xavier's letters were the equivalent of action-adventure movies for Catholics of the time.) Favre, on the other hand, spent the rest of his life as a spiritual counselor sent to spread the Catholic faith during the Reformation. His work was more diplomatic, requiring artful negotiation through the variety of religions wars at the time. "Take care, take care," wrote Peter offering advice on dealing with others with different opinions, "never to close your heart to anyone." Their letters reveal how different were these three personalities. They also make it easy to see how much they loved one another. "I shall never forget you," wrote Ignatius in one letter to Francis. And when, during his travels, Xavier received letters from his friends he would carefully cut out their signatures, and keep them with him--"as a treasure," in the words of his biographer Georg Schurhammer, S.J. Here, for example, is Xavier writing from India, in 1545, to his Jesuit friends in Rome, expressing love for his faraway friends. Excerpted from The Jesuit Guide to (Almost) Everything. In addition to being Chik-fil-A Appreciation Day, yesterday (Aug. 1) was St. Alphonsus Liguori Day. If you know a Redemptorist, remember to congratulate him. Thank you, thank you, thank you. Friendship: this is a topic that we should focus on more, to counter the ragged individualism of the current culture. This piece is so timely, Fr. Jim. I think friendship is the meat of community living.... it should be cultivated among us Catholics, so that in our differences of opinions we can still remain civil, respectful and yes, friendly. I hereby suggest to make St. Peter Favre the patron saint for bloggers of every shade! Thank you, Fr. Jim, for the beautiful, inspiring story of these three extraordinary men and their touching friendship. Thanks;, too, Maria, for giving us the beautiful prayer of Blessed Peter.